Subatomic particles called neutrinos are notoriously hard to catch because they pass right through regular matter like ghosts. But a new study shows that high-energy neutrinos from cosmic sources aren't totally unstoppable. 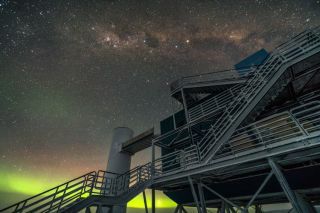 Researchers from the IceCube experiment in Antarctica announced this week that they have measured the rate at which high-energy neutrinos interact with regular matter instead of passing through unencumbered. The IceCube experiment was designed primarily to study aspects of particle physics, but neutrinos can also reveal new information about energetic cosmic events, like exploding stars or colliding black holes. They could even provide scientists with new clues about the mystery of dark matter. Neutrinos don't really affect the everyday lives of most humans: they don't make up atoms (like electrons, protons and neutrons), and they don't play a crucial role in objects their mass (like the Higgs boson). And yet about 100 trillion neutrinos pass through your body every second, according to a statement from the IceCube collaboration. Most of those neutrinos come from the sun, which releases a constant stream of low-energy neutrinos out into space. The neutrinos that IceCube is seeking — those from cosmic sources — are almost a million times more energetic than solar neutrinos. These high energy neutrinos may be released by a variety of cosmic events including supernovas (exploding stars), black hole collisions and gamma ray busts (which may have multiple causes, including colliding neutron stars). "We always say that no particle but the neutrino can go through the Earth," Halzen said in the statement from the University of Wisconsin. "However, the neutrino does have a tiny probability to interact, and this probability increases with energy." The IceCube detector is buried under about 1 mile (1.6 kilometers) of ice, and collects neutrinos coming through the Earth from all directions. Thus, the detector is able to observe how many neutrinos are stopped as they pass through the planet at varying depths. The IceCube Lab with the South Pole station in the background. Taken in March 2017. The IceCube scientists "found that there were fewer energetic neutrinos making it all the way through the Earth to the IceCube detector than from less obstructed paths, such as those coming in at near-horizontal trajectories," officials said in the statement from the collaboration. The rate at which neutrinos should interact with regular matter, based on the neutrinos' energy, is called the neutrino cross section. Those values are predicted by the Standard Model of Physics, which is the most accurate model that scientists have put together of how the physical world should behave. A result that appears to contradict the Standard Model could indicate that scientists had stumbled into "new physics," or an aspect of the universe that has not yet been predicted. "We were of course hoping for some new physics to appear, but we unfortunately find that the Standard Model, as usual, withstands the test," Halzen said in the statement. The IceCube observatory consists of an array of 5,160 basketball-sized detectors, spaced out evenly along 86 "strings" that are dropped down into boreholes in the ice. Collectively, the strings and the detectors take up 0.24 cubic miles (1 cubic km) of ice, located 1 mile (1.6 km) beneath the geographic South Pole. When neutrinos are absorbed by or collide with particles of regular matter, the interaction produces showers of secondary particles. Those particles generate light in the IceCube assembly, which the detector picks up. Researchers can use the signal to measure the energy of the original neutrino and the direction it came from. The ice blocks particles other than neutrinos that would interact with the detector and create noise in the data. It's possible that with more data, researchers could use IceCube to study the Earth’s interior, perhaps mapping the thickness and of its inner and outer cores, according to the statements. The new paper only relies on data from one year of IceCube observations — between May 2010 and May 2011 — so there is still more for the researchers to analyze. "We have more than seven years of data in the can with the completed detector; therefore, we will deliver a much more precise measurement in the future," Halzen said in the statement from the University of Wisconsin.